The new year arrived which might have prompted you to wonder what you are doing with you life. (We’ve all been there.) Maybe, you tell yourself, it’s a time for a new job, something with awesome benefits and a great salary. Well, lucky for you, Tri State Commercial Realty is looking for real estate agents. So if you’re feeling like a career in commercial real estate is the right move for you, read on. 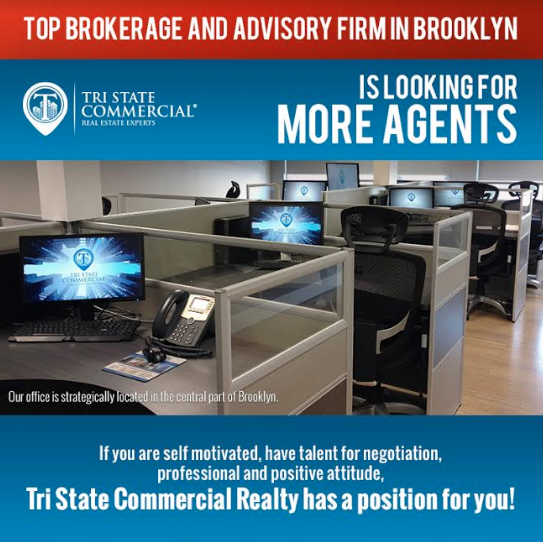 Tri State Commercial Realty is one of the leading real estate advisory and brokerage firms specializing in commercial leasing and investment sales in the NY Metro Area. They are based in Prospect Park, South Brooklyn. Highlighted by its integrity, honest dealing, commitment to professionalism, excellence, and personalized service, Tri State Commercial realty is a major player in the commercial real estate industry thanks to its solid client base of landlords, developers, and credible tenants. If you’re interested, upload your resume here. This Q & A interview with Tri State Commercial Realty founder Shlomi Bagdadi examines how the upcoming brokerage became successful in the competitive world of commercial real estate. What gave you the inspiration to start your own business? BAGDADI: I kind of always had my own business, but before that, I was in a few different corporate positions. I started in banking, then got into e-commerce. While I was in the e-commerce business, I bought a couple of real estate properties. I worked with a few partners, but under certain circumstances, I had to dissolve the business relationship with them. I decided then to fully invest professionally in commercial real estate. I’ve always had the passion. Shlomi began his endeavors in real estate in the early 2000s. He then worked for a firm in Sheepshead Bay where he gained perspective on the cut-throat race of real estate. As time passed, he realized the benefits of owning his own company and a broker license. BAGDADI: Commercial needs real understanding of the business; and the entire chain of command from landlord to tenant and the connection between the people involved--including brokers, attorneys, architects, etc. Understanding this chain and how it works led me to starting my own business. You’ve got to be creative and able to structure deals. In residential, it’s a bit simpler; there’s a lease then there’s a sale. For example, when you’re selling a multi-family you look at the income and expenses of the building. How many apartments? How many vacancies? What’s the rent roll? That’s it. If the person is interested then they go to the attorney and they finish the deal. Leasing in commercial real estate is different. You have to tailor the deal from beginning to end, stitch by stitch--until you get it sealed. In his 14 years of experience, Shlomi describes other factors that attribute to his success. BAGDADI: Integrity. Definitely, hard work and transparency. I tell it like it is. Shlomi’s honest attitude and charisma has set him apart from other commercial brokers. Due to his dedication and passion, Shlomi was able to win the CoStar Broker Firm award within a year of service. How did that feel? Were you aiming for that or was it a surprise for you? BAGDADI: I kind of predicted it was going to happen because of the number of deals we’ve done. We kept submitting our deals to CoStar because we kind of had a feeling. Brooklyn is an upcoming market. It has been an upcoming market within the past few years. I saw the opportunity back in 2012. After observing the rundown buildings and storefronts with “For Rent” signs, Shlomi saw a chance to take over the commercial real estate market. Moreover, he comments on his future plans for Tri State Commercial. BAGDADI: I would like to expand the team and into new markets. I’ve been asked by landlords if I’ll expand into Queens, the Bronx--I’m aiming to do so in the near future. However, expanding to new markets will lead to more competition. Are you afraid of having more competition? BAGDADI: No. I love competition. It’s motivation for me, it fires me up. BAGDADI: No, I draw inspiration from my kids, my family. It’s a combination of both. My competition motivates me to succeed and my family keeps me on track. And who is your biggest competitor right now? BAGDADI: Cushman & Wakefield is one of our biggest competitors. We’ve also taken listings from Winick and RKF--they know us and they know we’re competing. There’s also Ben Weller, ABS partners, and Leon & Associates. Each one is my competition in a different area of Brooklyn. Like Ben Weller is in Bushwick and Leon & Associates is my competition in Williamsburg. 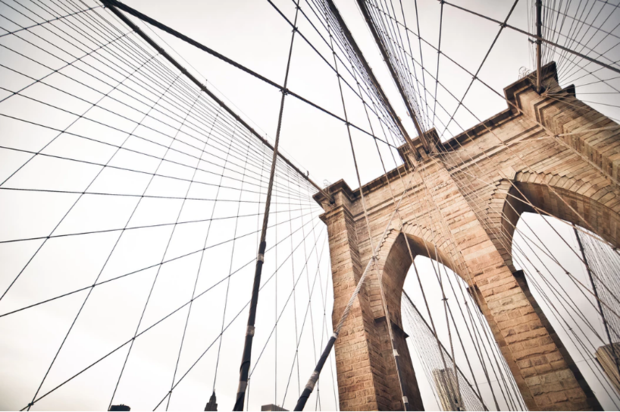 ABS partners have some listings in East Williamsburg and RKF is in downtown Brooklyn. Competition is only one of the many worries in the real estate game. Each firm must keep up with the changing market and predict what the next move in real estate will be. How do you manage to keep up with the changing market? BAGDADI: By embracing technology. We try to automate the process as much as possible. There’s no replacement to the human touch; however, there are technical steps during the leasing process that can be automated and that’s where we implement our technology. We also have teamwork on a corporate level; meaning that everyone is part of the team. Everyone is unique and they feel that. It’s not like in other companies where they support individual growth and they want you to be alone and just kill deals. Here we support each other and just try to deal with issues/obstacles as a team. Do you think that your team sets your company apart from others? BAGDADI: Sure. My team is very diverse. We have people from all over the world here. We have a variety of cultural backgrounds, which allows us to interact with people better--and get our message through, no matter what the other person’s culture is. And so, how do you find people to bring to Tri State Commercial, that’ll care about the company as much as you do? BAGDADI: When people really have the passion to grow, that’s what I look for. I interview everyone personally and when I realize they’re determined; that’s when I ask them to join my company. They also have to have a sense of commitment and be reliable. Equally important, they have to be able to be part of a team. It’s very difficult to find, in the commercial broker’s world, people who don’t want to stab other people in the back. For us, this is negative energy that we try to keep out the door. That’s one advice I would offer people in business. Surround yourself with positive energy. What’s another piece of advice you would offer business owners? What skills do you need to be successful? BAGDADI: Aside from having a good team, persistence. Persistence is key. It’s also important to acknowledge credit where it’s due. Having an appreciation for everyone that’s helping you reach your goal is crucial. Another thing is personal review. You have to review yourself all the time. You have to be honest with yourself. That’s the best way to achieve long-term success is always being honest, and hard work. Don’t cut any corners. Confront any challenges you may face along the way; don’t run away from them. I, for example, analyze every challenge and break it down, so that I learn from it. That’s how I come out stronger, by avoiding getting into that situation again. When asked what his most memorable moment as an owner was, he mentioned one deal in particular that stuck with him. BAGDADI: Last year, I made a deal at 4212 Church Ave with a wheelchair care nonprofit organization. They support handicap people. They’re called Wheeling Forward. What’s awesome is that you feel like you’re doing the deal to help people. It makes you feel like part of the community. Bringing such an organization to that area meant a lot. They were looking for a space and they weren’t sure where to go. I offered 4212 Church Ave to them and immediately they acted on it. They felt like there was a need in that neighborhood for that kind of organization. So being part of that kind of thing is memorable. Shlomi has set himself apart in the commercial real estate world due to his love for the business. He also stays level-headed as a CEO. He encourages teamwork with positive energy and attention to detail; ensuring that everyone in his company feels needed, important, and can share in its success.